Chris' sister Pat complained that we haven't been posting recently. It's been cold and cloudy and the usual birds have been around: finches, cardinals, woodpeckers, titmice, juncos, etc. 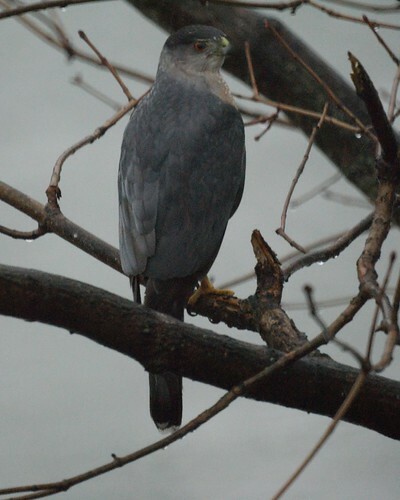 However, they all leave when the sharp-shinned hawk comes by. Saw one of these guys on my way home today, standing on a flapping pidgen, 5 feet off the road. Pulled around and watched with the glasses from 25 yards for 3-4 minutes, till it quit flapping, then he flew off, low through the trees. Way cool. Thank you for helping me with the ID.